It’s a Thanksgiving miracle. 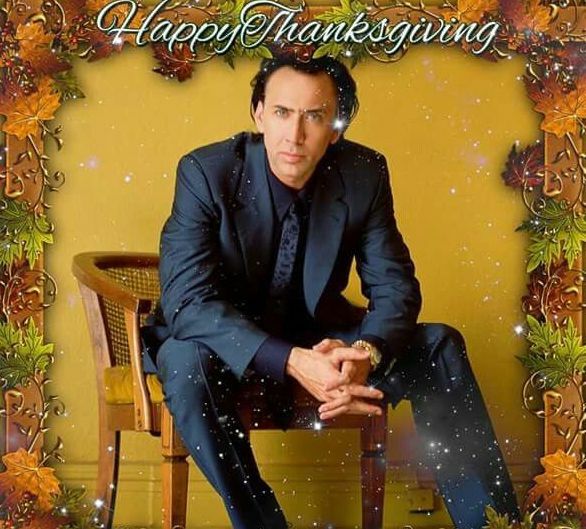 Sports Betting Nicolas Cage decided to hold off his rage on his Week 11 NFL bets and give us bets for all three Thanksgiving matchups. Week 11 sucked. And I’m angry. The Panthers…lost? Is this some sort of karma for when I pulled a gun on an old lady? She wouldn’t help me with my case! As far as the Ravens bet, well I have no one to blame but myself. I made the bet before confirming whether a few Bengals on defense would suit up. Washington loses Alex Smith, and yet Colt McCoy comes in as backup and almost wins them the game against the Texans D? If I had lost that bet, God only knows what I would have done. I’m 9-5 in my NFL bets over the past four weeks, despite last week’s hiccup. And since the season of giving is upon us, I cooled myself off and am giving you a special Thanksgiving slate of NFL bets. The home team is always on the right. A minus spread shows that the home team is the favorite, while a + spread shows the home team is the underdog. Remember, my pick always includes the spread. Seriously, I hate these damn divisional games. The Ravens couldn’t cover against the pathetic Bengals last week, and I’m ready to burn down M&T Bank Stadium for losing a second bet on the season picking them. Anyways, I’m salty that I didn’t keep riding the Bears against the spread last week. However, their starting QB hurt himself in Week 11. I don’t care that Chase Daniel played in Kansas City at the same time Bears coach Matt Nagy coached Kansas City’s offense. This game won’t go over the 44.5 total points now that Trubisky sits, especially when Detroit’s offense will be without their starting RB and #1 WR. I know what Alex Smith is going through. I screamed like a girl. Anyways, I really hate betting on this game since Alex Smith to Colt McCoy doesn’t seem like much of a drop off in QB production. And who the hell knows which Dallas team will show up. Will it be the team that stunk it up against the Titans? Or will it be the one that outplayed Atlanta and Philly in successive weeks? If I had to predict how McCoy will play, he’ll could be successful in chucking the ball downfield, leading to more Washington points. Or, he could gift wrap Dallas multiple turnovers with a short field. Either way, I think more points will be scored than assumed. I feel most comfortable betting the OVER on a low O/U. Friends and family are begging me to take Xanax tomorrow as we speak. Right now, there’s no more complete team in the NFL than the Saints. And yet, I can’t shake this feeling that a 13 point spread is a lot to overcome against a divisional opponent like the Falcons. Alvin Kamara should explode against an Atlanta defense that’s been getting gashed all year. New Orleans averages over 37 points per game this season, and they should be able to reach that point total against statistically the worst defense in the NFL. They already scored 43 against Atlanta earlier in the year. However, Atlanta’s offense is no slouch. They average 26 points a game, and scored 37 against New Orleans earlier this season. In a game where Atlanta must win to keep their playoff hopes alive, and New Orleans must win to keep home-field advantage throughout the playoffs, I say they play the game to their strengths. Take the OVER and have a good laugh after you’re rolling around in the money you made. Happy Thanksgiving everyone, and you’re welcome for the betting tips. This entry was posted in StakeHaul Challenges and tagged bets, betting, football, gambling, NFL, nicolas cage, sports betting, StakeHaul. Bookmark the permalink.